Considering I’ve only ever really made white or wholemeal plain loaves before, this was aspirational bread-making. But surprisingly easy, and most impressive. Coarse sea salt or crystal salt, for sprinkling. Get the largest bowl you have. The bigger it is, the less chance of flour getting everywhere. Also, for god’s sake wear an apron. Flour everywhere. 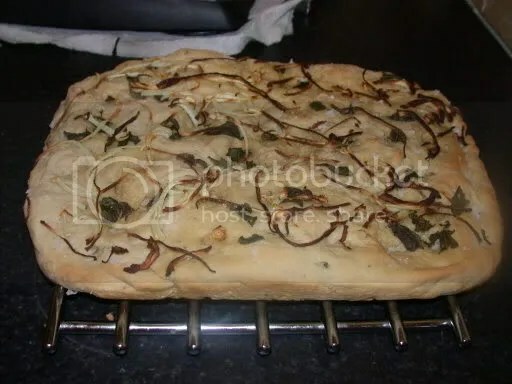 Put the flour, yeast, chopped sage leaves and salt into the bowl, make a well in the centre and gradually work in the warm water and 3 tablespoons of the olive oil. Work it all together using a wooden spoon until you can lift it out of the bowl in one go. Place it on a floured surface and knead it for about ten minutes. What you want is for the dough to feel smooth and to bounce back a bit when you prod it with a finger. Be brave, because it can feel like you’re not going to get to this stage but it’ll happen. If it’s too dry, add a bit more water but not too much, don’t let it go soggy. If it gets soggy, add more flour. Leave this covered with a dample cloth for about an hour until it’s doubled in size. Isn’t that clever, how dough rises? 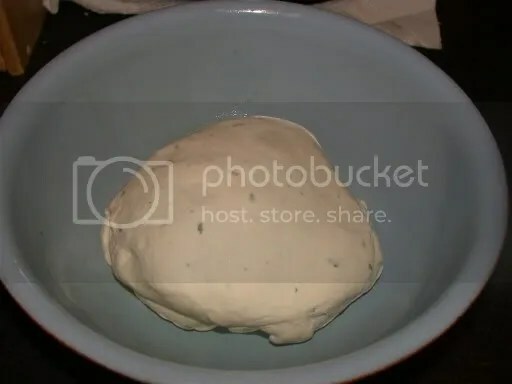 Take the dough out of the bowl and knock it back. Don’t knead it too much, you want to keep a bit of air in it. Just give it a couple of punches. Now roll it out until it’s roughly a rectangle and place it in or on the tray you’re going to bake it in. Stretch it out so that it fits the tray. I used a large roasting tin because it was the most handy thing I had. 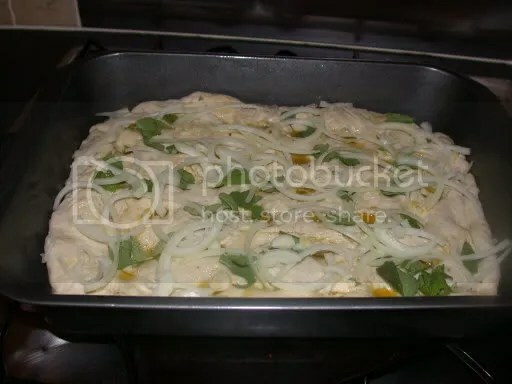 You could use a large oven tray. Put it in the oven and bake for about 25 minutes, until it’s turning golden. When done, let it cool on a wire rack. Oh my god, that looks absolutely amazing and lovely. Again, though, I wonder about your measurements for the flour. Do you use grams as a measurement of weight for the flour (ie. 700g = 0.7kg worth of flour in weight) or volume (ie: g = mL so that 700g is just short of three measuring cups)? It’s a measurement of weight, not volume. But I’m guessing 3 cups is about right anyway. According to this site it’s 3.045 cups. No mention of when to add the yeast in this recipe!!! !